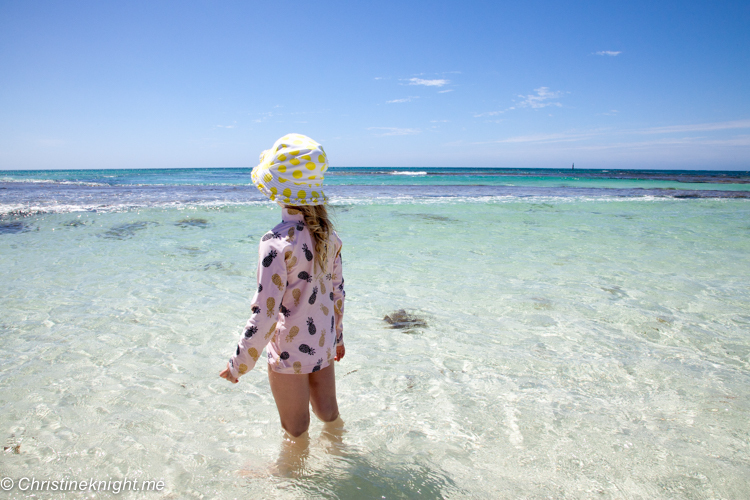 Rottnest Island Day Trip, Perth, Western Australia - Adventure, baby! 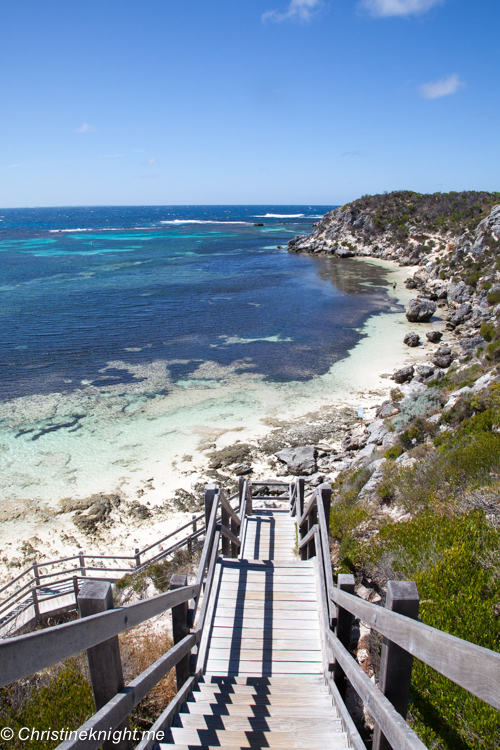 Rottnest Island, off the coast of Perth, Western Australia, is a place to witness the wild, raw beauty that Australia is so famous for. 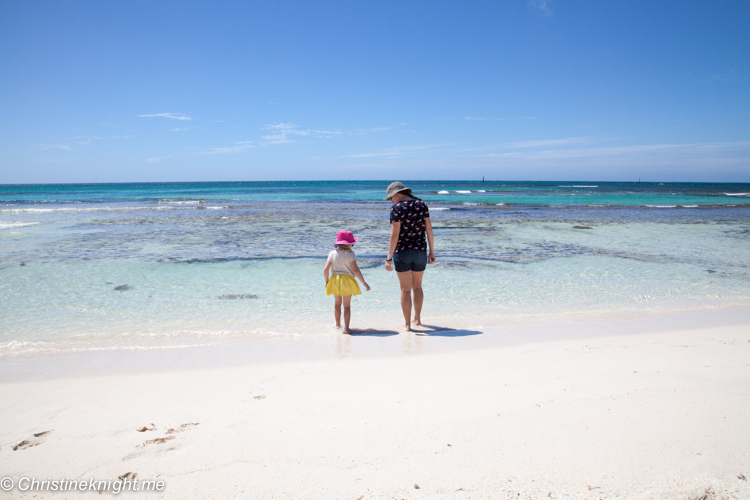 If you’re interested in incredible wildlife or white sand beaches, a Rottnest Island day trip is an absolute must for visiting this part of the world. 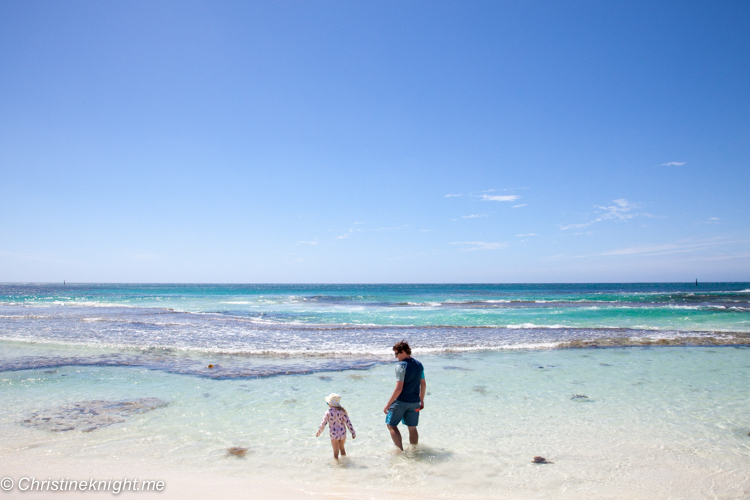 Words fail me when I try to describe why Rottnest Island is so special. “Majestic”, “breathtaking” and “spectacular” all sound like hyberbole, but they’re the best words words to describe this unique island. 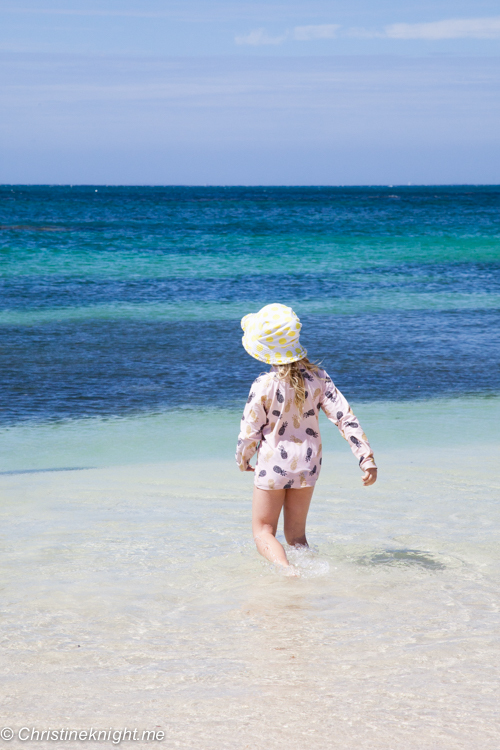 Whether you stay for one day or five, Rottnest will enchant, inspire and recharge the souls of your entire family – and leave you planning your next visit the moment the ferry departs. 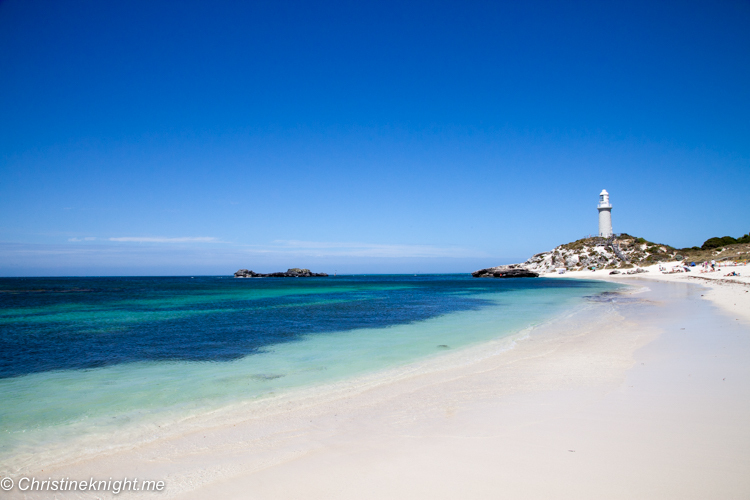 Rottnest is a small island off the coast of Western Australia, located 18 kilometres west of Fremantle. 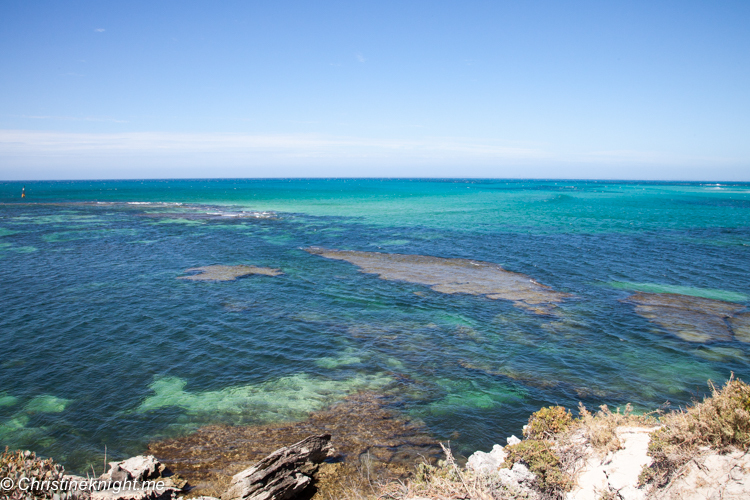 It is believed that Rottnest Island was separated from the mainland 7,000 years ago. There have been numerous artefacts found all over Rottnest that indicate it was home to Aboriginal people prior to the separation of the Island from the mainland. 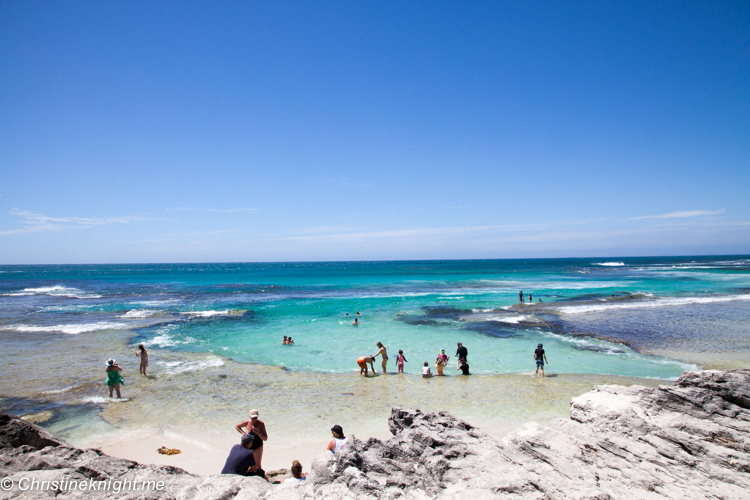 The Aboriginal name for the island is Wadjemup, and it is a place of significance to Aboriginal communities. 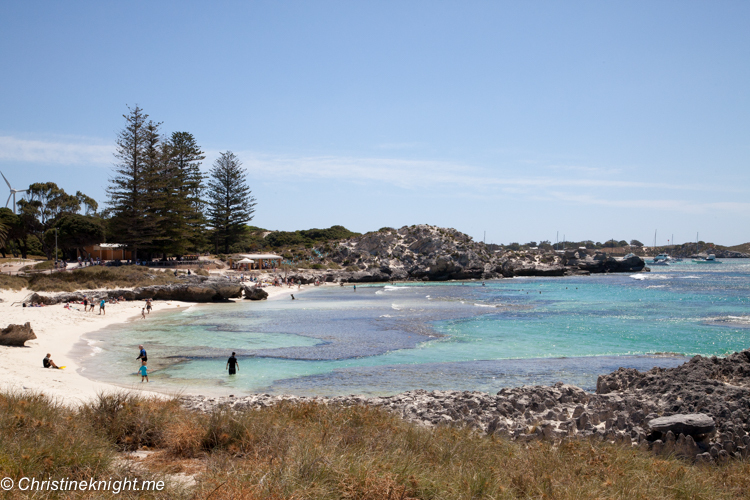 There are 17 sites on Rottnest Island listed under the Aboriginal Heritage Act 1972-1980. 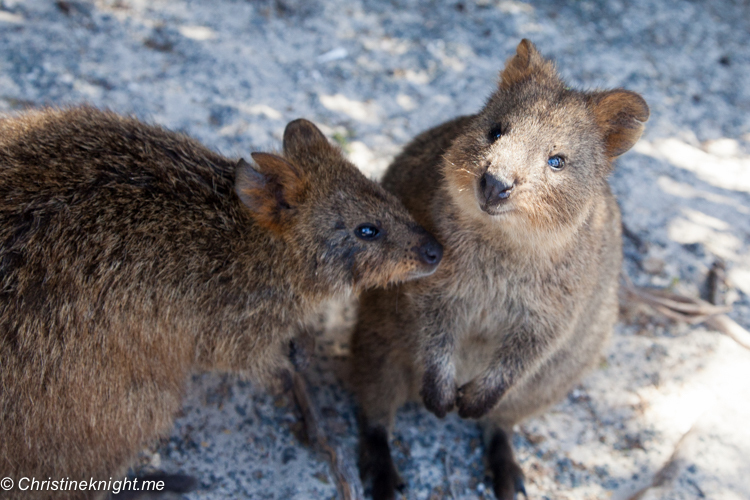 Europeans discovered Rottnest Island in the 17th Century. 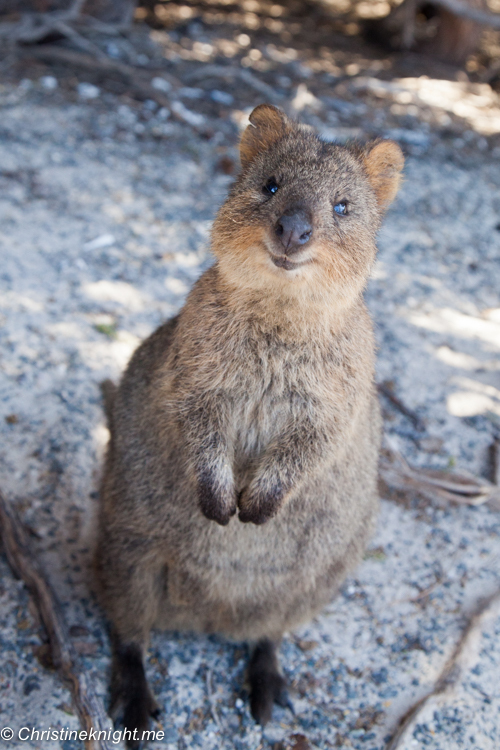 Samuel Volkerson and his crew of the Dutch ship Waeckende Boey are believed to be the first Europeans who actually landed on the island in 1658, but it was William de Vlamingh, in 1696, who gave the Island its name after the abundance of quokkas he saw, mistaking them for rats. 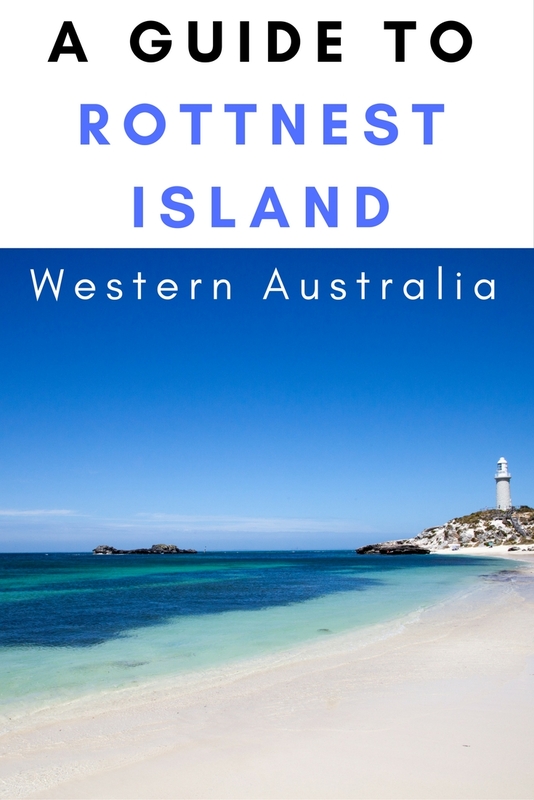 He named the Island ‘Rotte nest’ (meaning ‘rat’s nest’) and the name of the Island was eventually adapted to ‘Rottnest’. 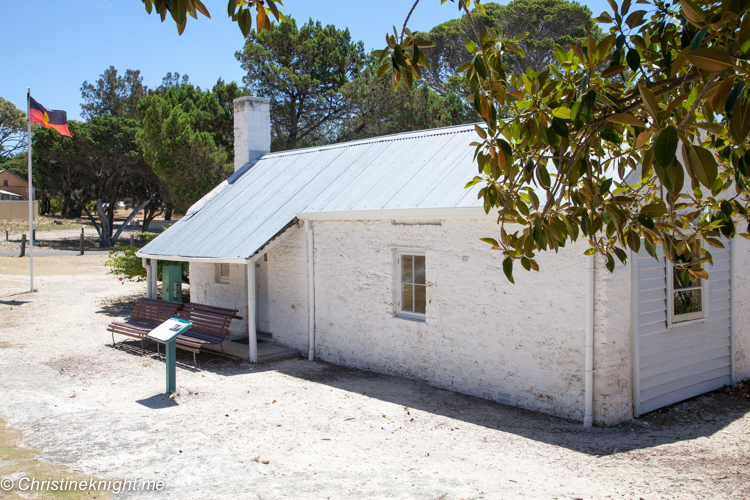 From 1838 Rottnest was used as a penal establishment for Aboriginal people, with the prison officially closing in 1904, but with prisoners used to build roads and other works on the island until 1931. Ferries started bringing tourists to Rottnest in 1902, with the first public jetty being built in 1906 and further development for visitors following soon after. 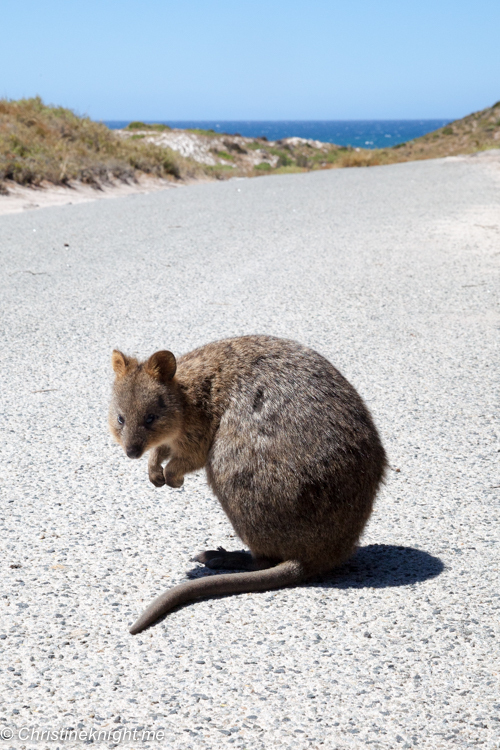 Today, Rottnest is well known for its 63 beaches with sparkling white sand, superb snorkelling, happy quokkas and plenty of roads and history to explore. 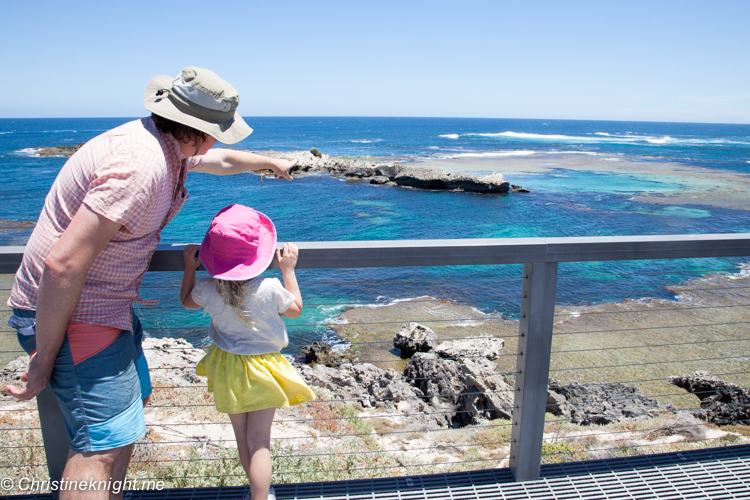 A Rottnest Island day trip is an easy way to see a bit of everything the island has to offer, without the added expense or organisation of accommodation on the island. While I think there is enough to do to stay a few days, if you’re time poor, then a day trip is still plenty of time to see a bit of everything. 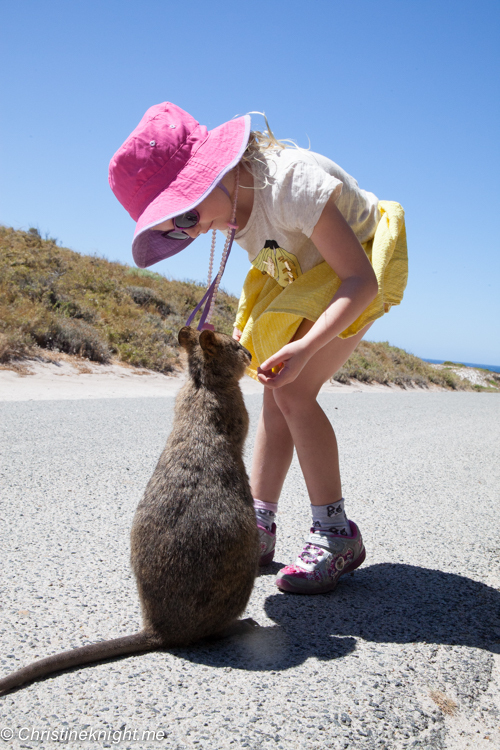 Taking a selfie with a quokka is often number one bucket list item for visitors taking a Rottnest Island day trip (including us!). 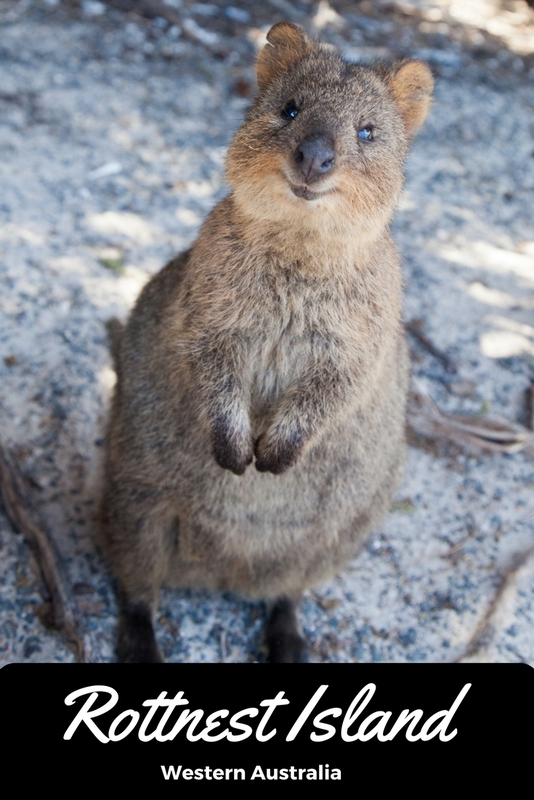 The Aboriginal people living in the Augusta and King George Sound areas of the south-west of Western Australia gave the small marsupial it’s unique name. They are generally nocturnal, however they can be seen during the day hoping to steal food from tourists or resting in the shade under bushes. 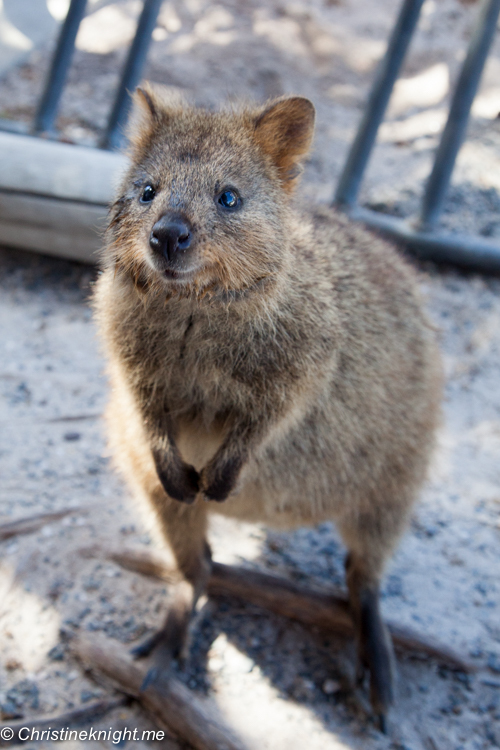 While quokkas are incredibly cute, it’s important to remember that all plants and animals on Rottnest Island are protected by law. Wildlife should not be disturbed, rather observed from a reasonable distance. 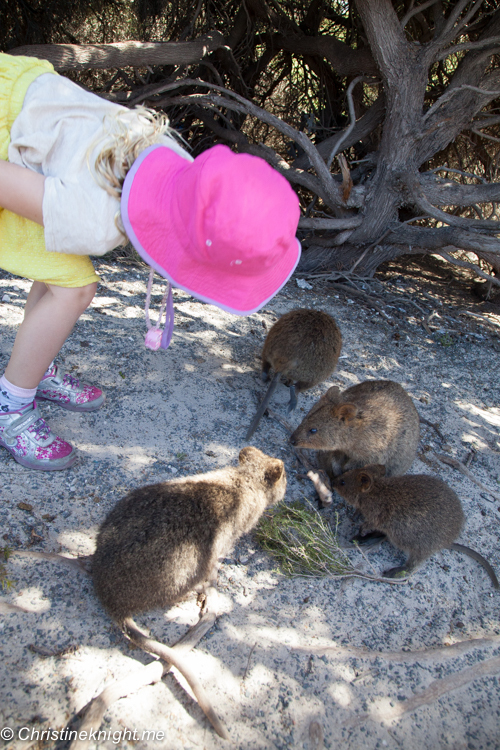 Please remember Rottnest Island is an A-Class Reserve and these beautiful creatures are wild and should not be touched, fed human food or provided an artificial water supply. More information available here. 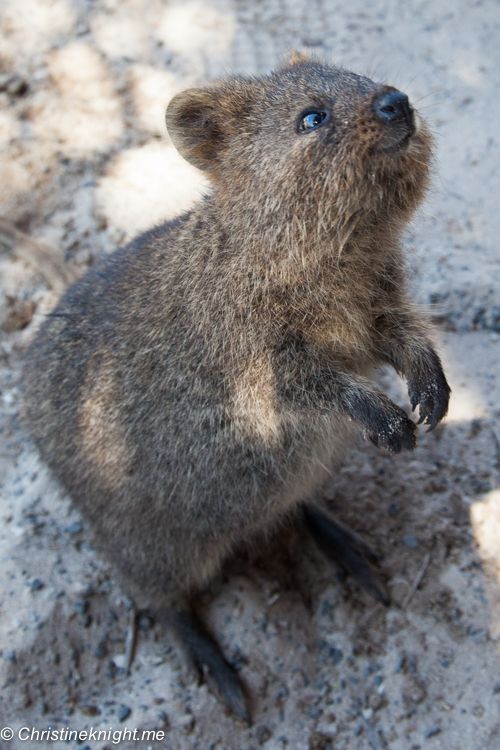 That said, the quokkas are incredibly used to tourists and are very curious little critters. You will find them come up close to take a better look at what you’ve got in your bag (keep it zipped shut and any food sealed). 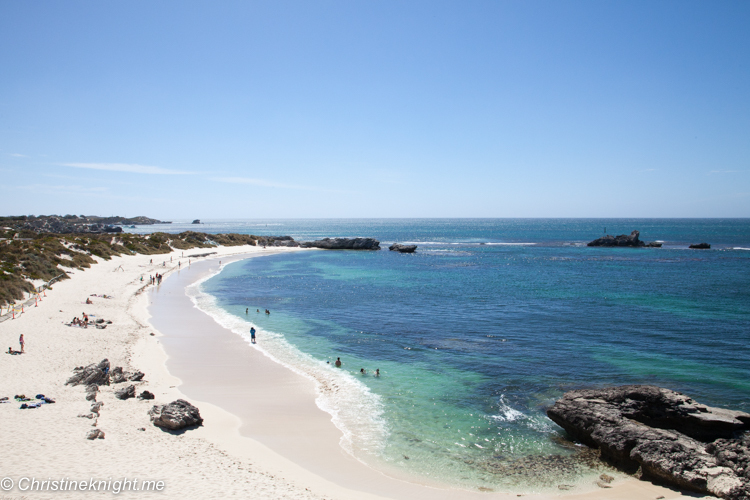 Rottnest is home to 63 glistening beaches and 20 secluded bays, each one more spectacular than the next. If you’re spending just one day on the island, I suggest picking one beach to swim and snorkel at rather than rushing to see them all. 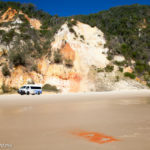 The most popular beaches for families are Ricey Beach, The Basin, Little Parakeet Bay, Little Salmon Bay and Geordie Bay. 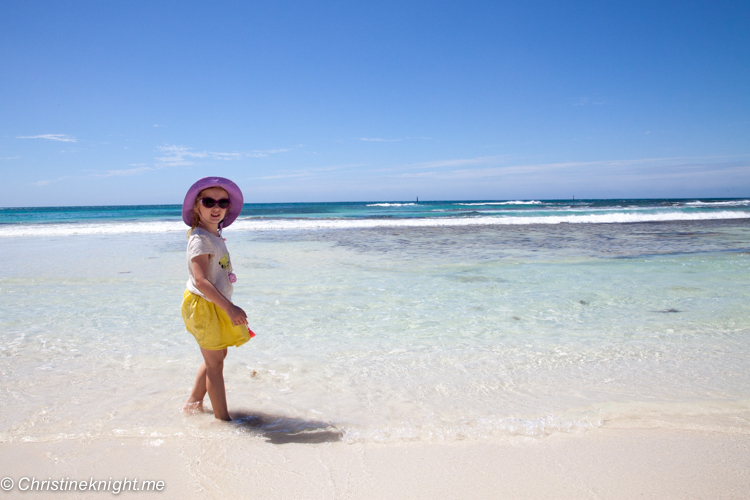 We chose The Basin to swim because of its shallow clear waters. It’s also well regarded for snorkelling – if you don’t have your own snorkels and masks, you can hire them on the island at Pedal & Flipper. A short walk along the coastline takes you to Pinky Beach, one of the prettiest beaches on the island, with the distinctive Bathurst Lighthouse in the background. If you keep walking up the beach and to the lighthouse, you’ll be rewarded by a gorgeous view, and a short walk back to the main settlement and ferry departure point. From the new viewing platform at Cathedral Rocks, the resident New Zealand Fur Seals colony can be seen flipping and playing in the bay and basking on the rocks. 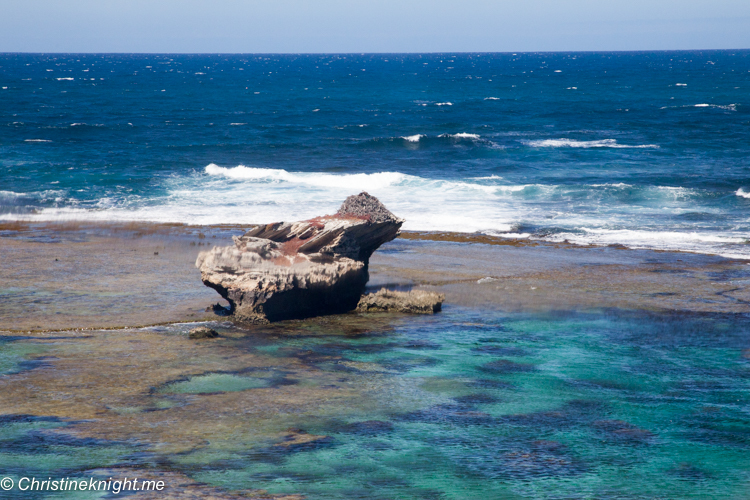 Cathedral Rocks can be accessed by bike or by jumping off the Island Explorer bus. 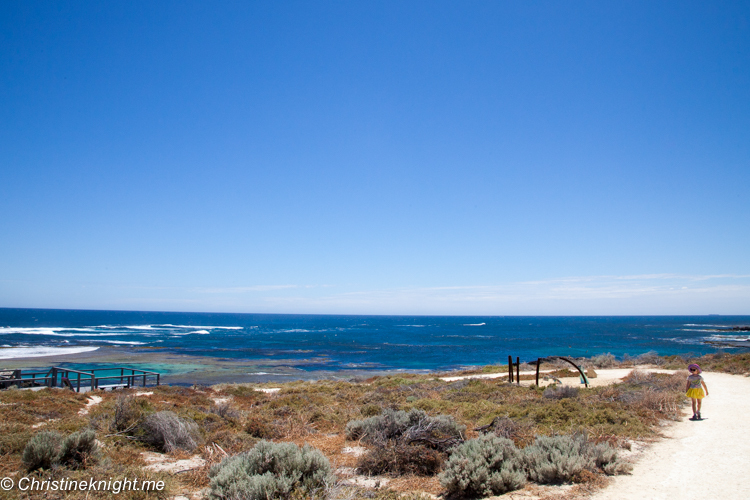 Of the two lighthouses on the island, only the Wadjemup Hill lighthouses is open to the public. Tours are conducted daily for a cash-only fee. 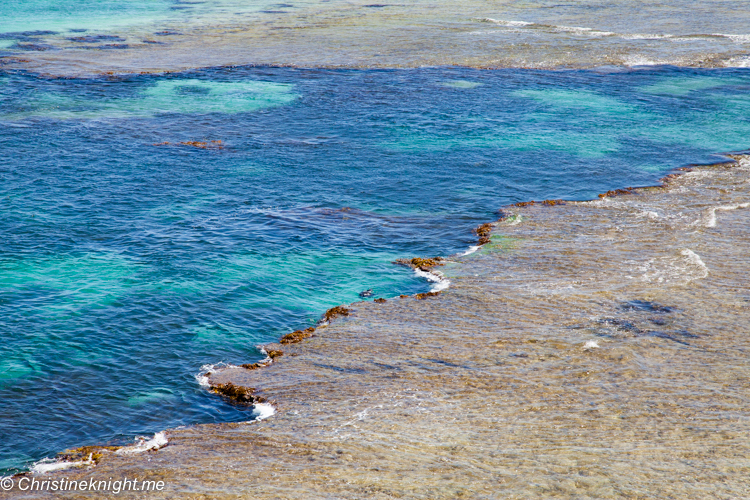 Take a segway tour, snorkel, play a round of golf or check out a movie at the cinema. There’s plenty to see and do. 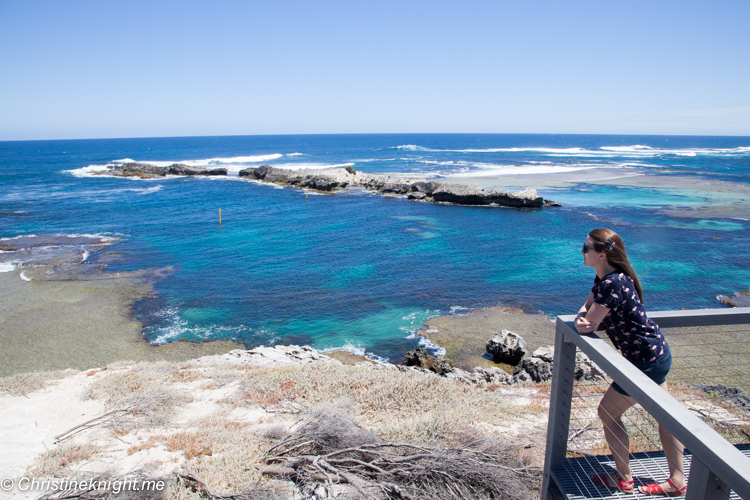 Sometimes, a Rottnest Island day trip just isn’t enough – honestly we could spend a solid week here and really enjoy it. Bring large water bottles filled with ice cold water. While you can refill the bottles in the main settlement, the rest of the island is mostly free of drinkable water. 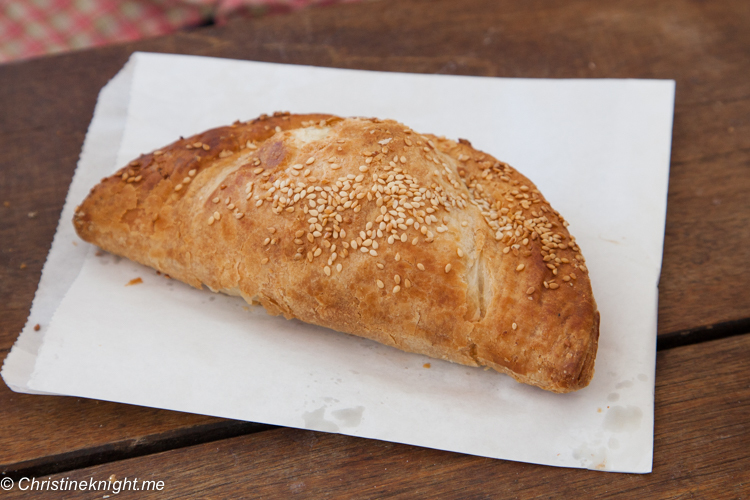 If you are arriving for a day trip, bring plenty of snacks or picnic foods as the only areas to buy food are the main settlement and Geordie Bay. If you’re planning on biking around the island or doing the Island Express hop-on-and-off bus as soon as you arrive, both of these take hours and will leave you famished, so taking food is a must. 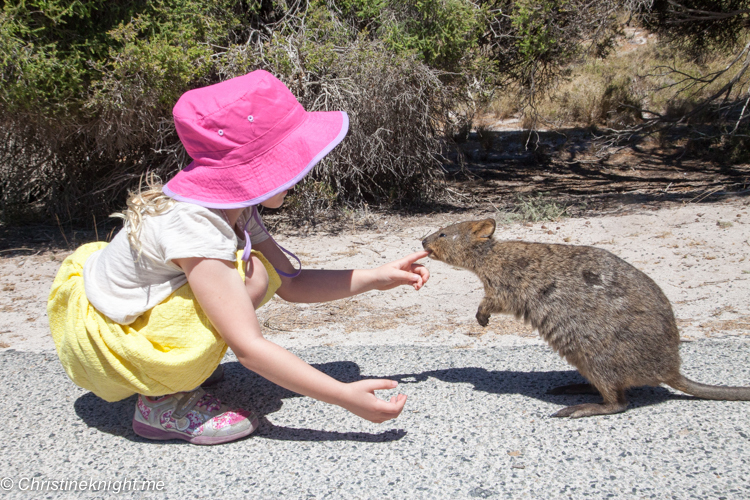 Don’t get caught without snacks on your Rottnest Island day trip! 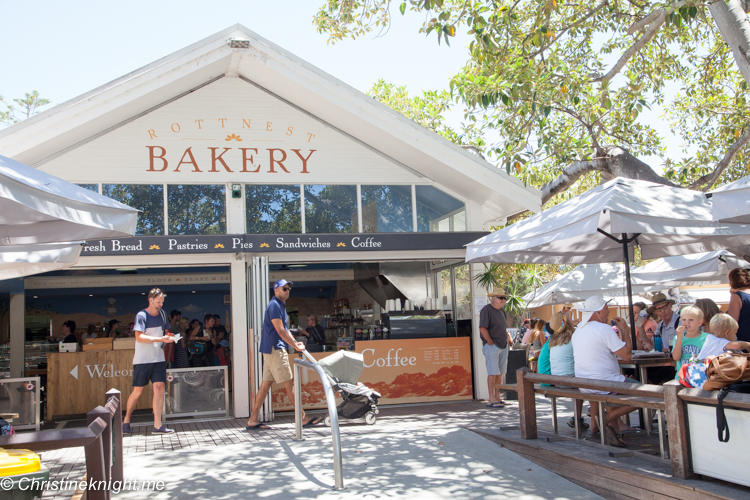 There are plenty of dining options on the island, from the General Store which has groceries and picnic supplies, to the bakery (our choice – they have fantastic pies, pasties and sausage rolls including vegetarian options) and more upmarket cafes and restaurants. You can’t leave without a scoop of Simmos Icecream. 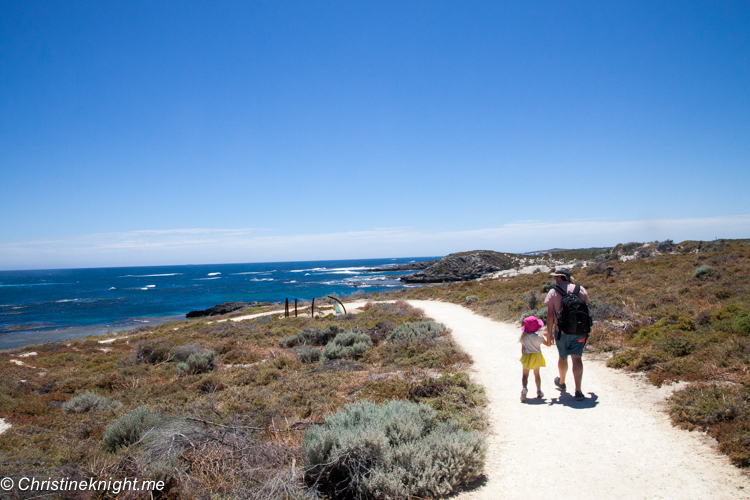 Rottnest is a small island, but it’s a long way if you’re planning to walk or bike it. With children on a day trip, I would advise catching the air conditioned Island Explorer Service bus, which is what we decided upon. The bus makes continuous circuits of the entire island, so you can jump off at each point if you like to take a quick look. The buses run every 30 minutes and cost $50 for a family of two adults and one child. Tickets can be booked online, from the Visitor Centre or Main Bus Stop vending machines. 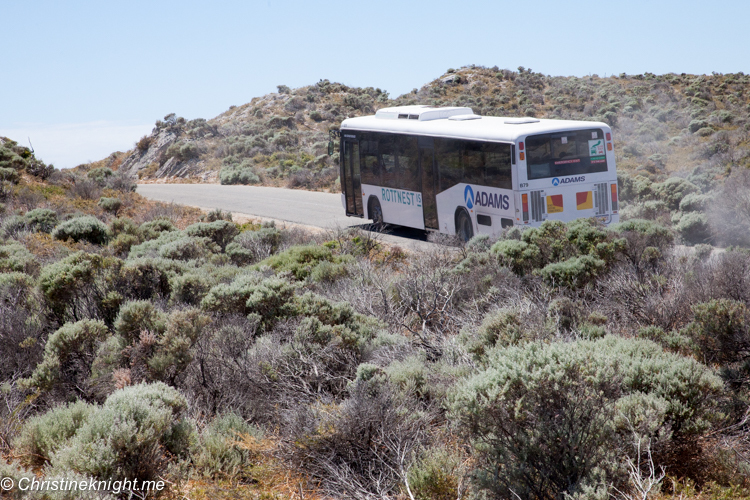 If you’re staying on the island, you can make use of the free Accommodation Shuttle Bus that runs between the main accommodation areas on the island. 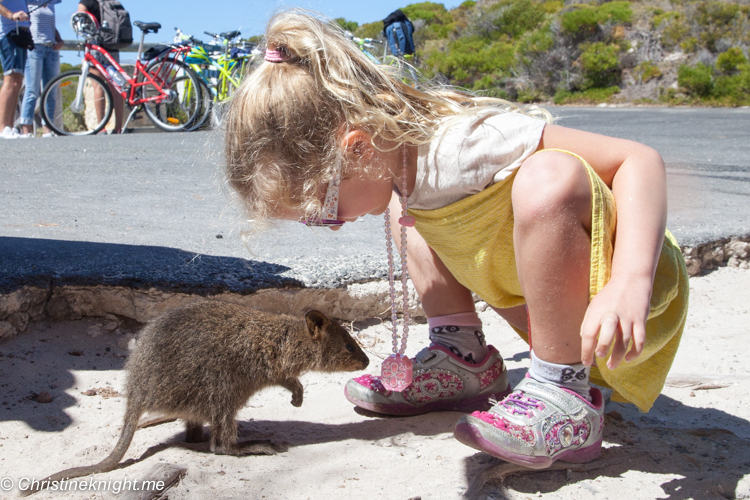 Exploring Rottnest by bike is also very popular, particularly when you’re staying a bit longer than just one day. 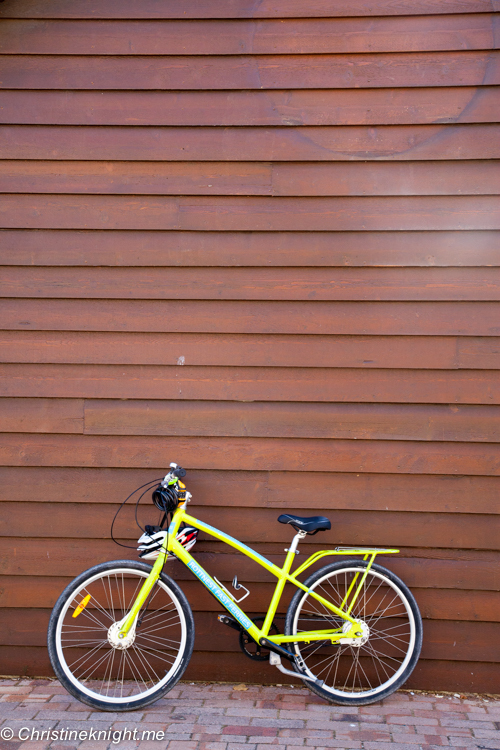 If you have your own bike, you can bring it on the ferry across to Rottnest. 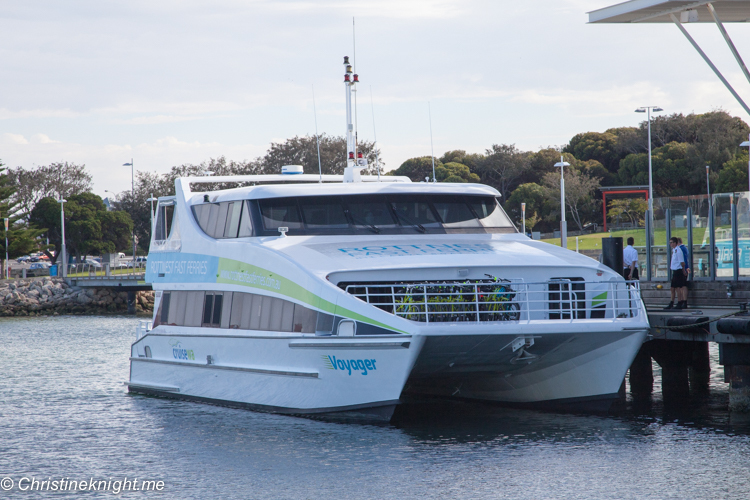 If you need to hire one, you can do so from either of the ferry services before boarding or from Rottnest Island Pedal & Flipper. The main settlement is very walkable and even has two playground areas for kids. 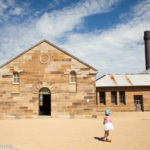 We walked from the main settlement to The Basin back again via Pinky Beach and the lighthouse. 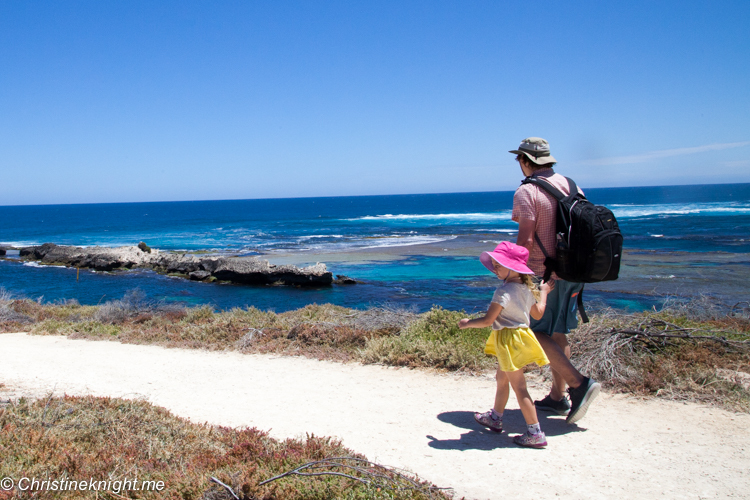 If you’re after a more challenging walk, try the Wadjemup Walk Trail, which is made up of five sections (50km in total). 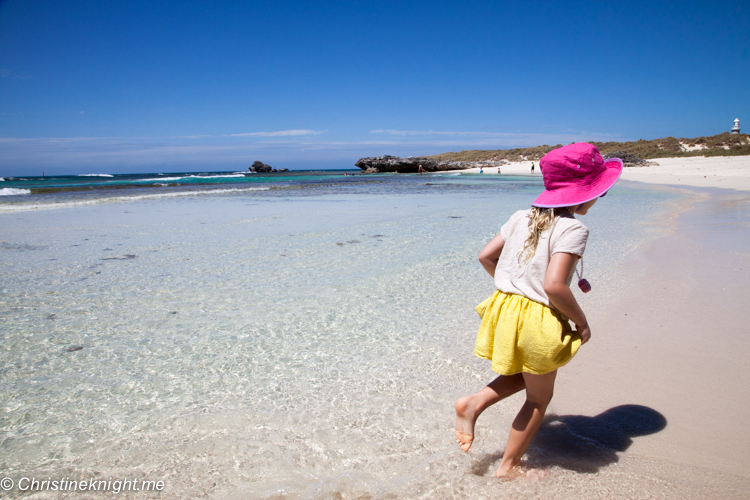 While we took a day trip to Rottnest Island, there are lots of accommodation choices should you wish to stay longer. 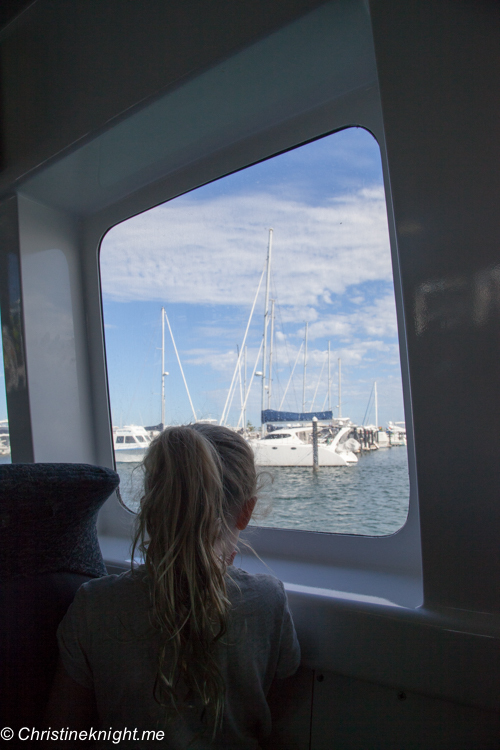 There easiest way to get to Rottnest Island is the ferry. 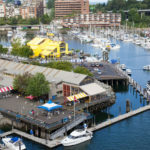 The ferries book up fast in popular seasons so be sure to book well in advance. 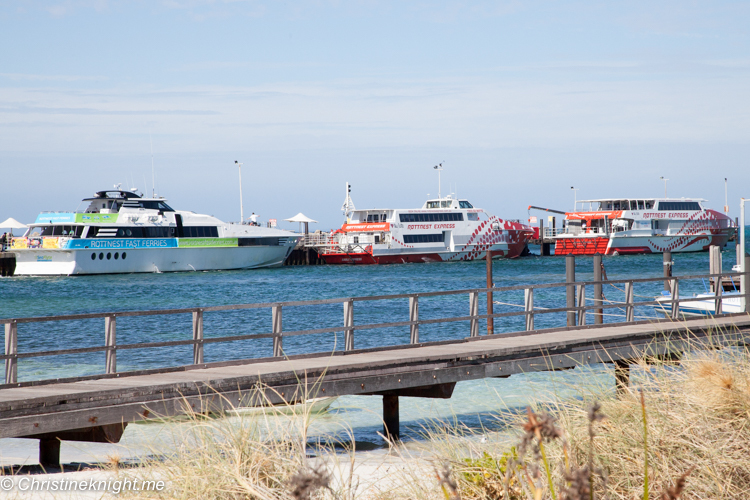 Rottnest Island ferry companies provide transfers to the island from Perth City, North Fremantle (Rous Head), Fremantle (Victoria Quay) and Hillarys Boat Harbour in Perth’s north. 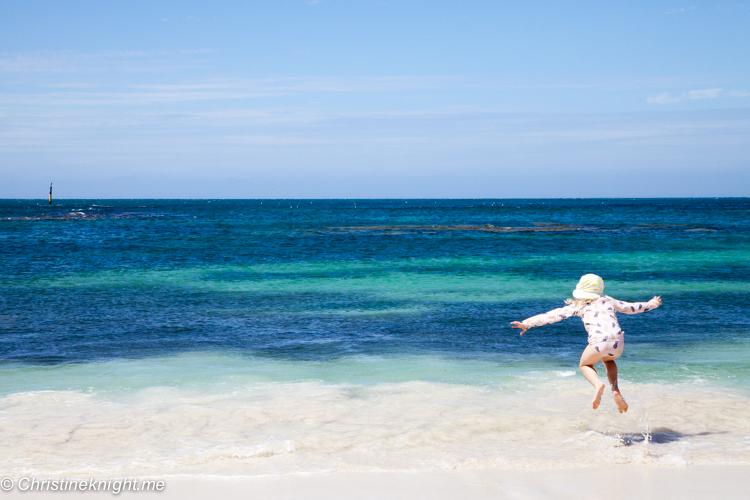 Rottnest ferries take approximately 25 minutes from Fremantle, 45 minutes from Hillarys Boat Harbour, or 90 minutes from Perth’s Barrack Street Jetty. 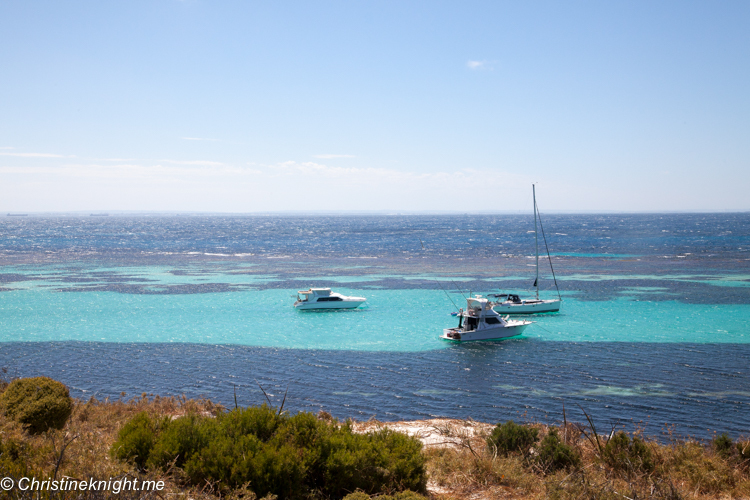 More info on getting to Rottnest Island. 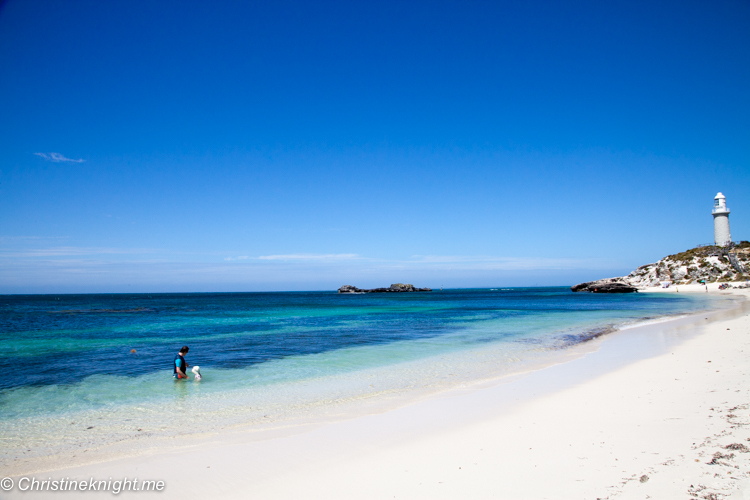 Rottnest Island is also accessible by personal boat and airplane. 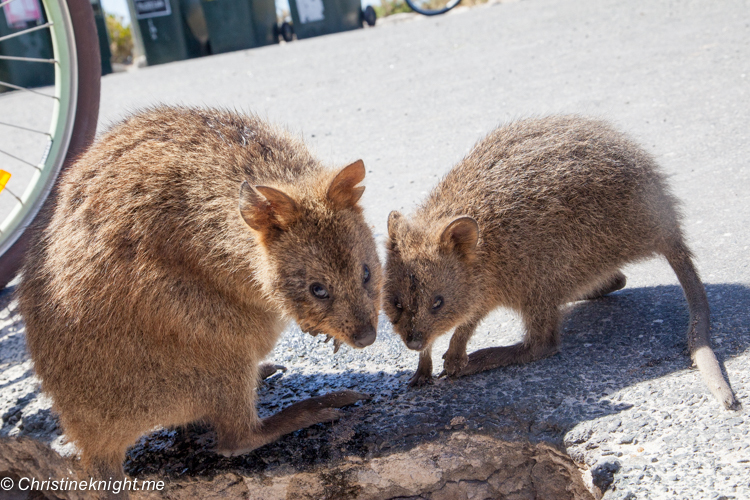 When travelling around the island, try the new, free Rottnest Island mobile app. 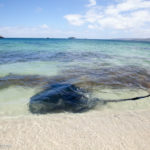 Sold on seeing Rottnest Island? Get more info on their website. 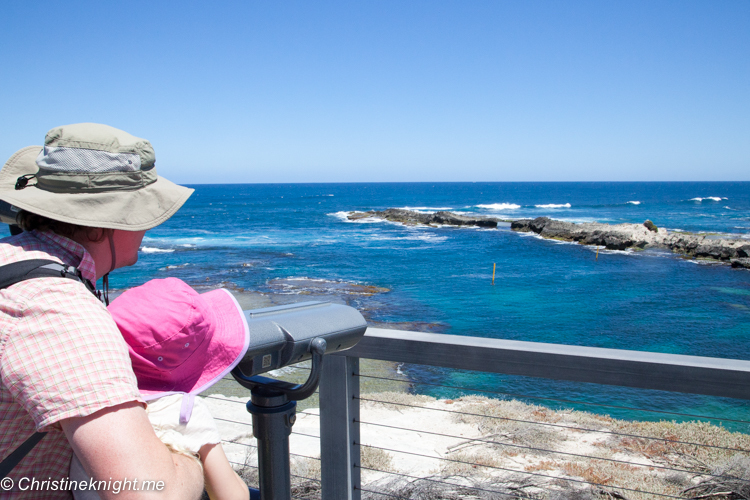 There is so much more to see and do in Perth. 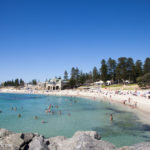 Get lots of info and tips from Experience Perth. 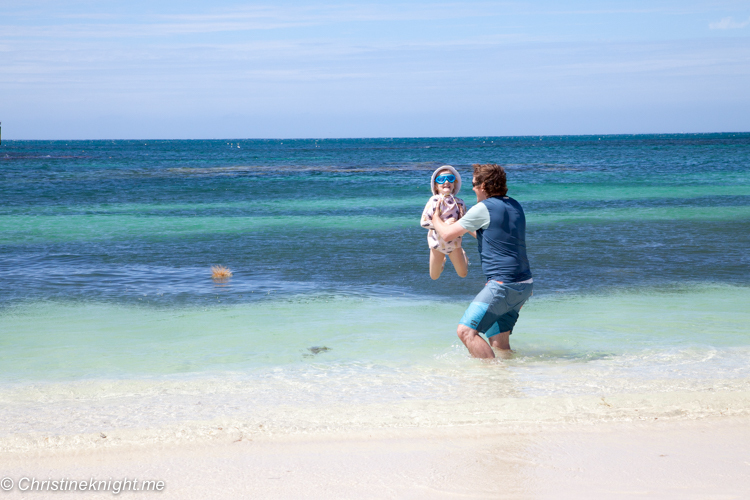 Our ferry trip to Rottnest Island was thanks to Experience Perth and Rottnest Fast Ferries. We covered all other costs ourselves. All opinions are our own. 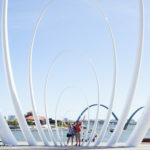 Find more things to do in Perth here. 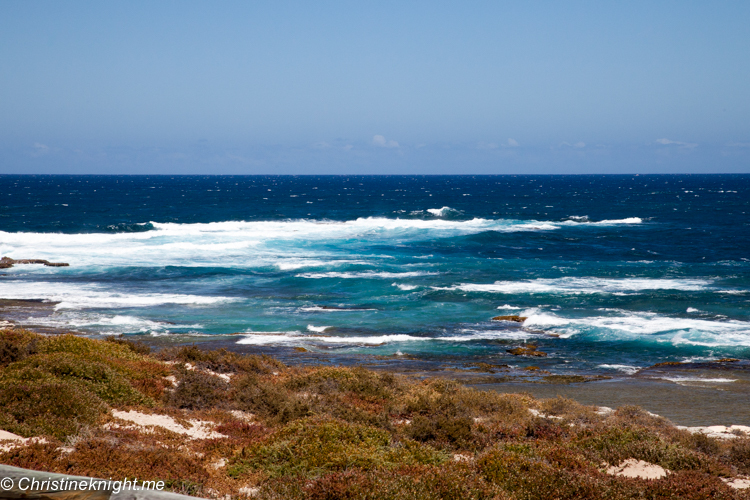 Get info on driving south to the Margaret River region here.